One of the great recent discoveries in modern biology was that the human body contains 10 times more bacterial cells than human cells. But much of these bacteria is still a puzzle to scientists. 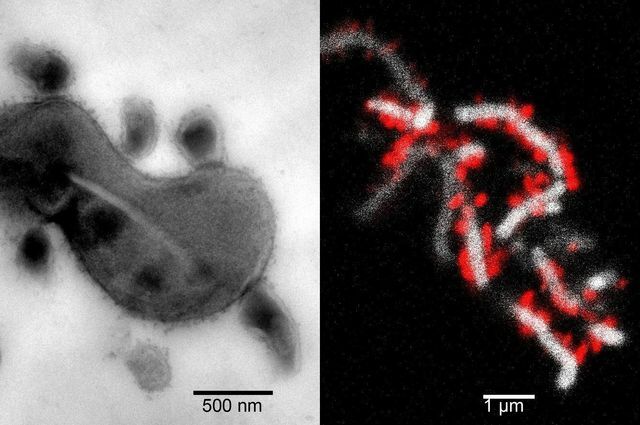 It is estimated by scientists that roughly half of bacteria living in human bodies is difficult to replicate for scientific research — which is why biologists call it “microbial dark matter.” Scientists, however, have long been determined to learn more about these uncultivatable bacteria, because they may contribute to the development of certain debilitating and chronic diseases. For decades, one bacteria group has posed a particular challenge for researchers. It is the candidate phylum TM7, which has been thought to cause inflammatory mucosal diseases because it is so prevalent in people with periodontitis, an infection of the gums. Now, a landmark discovery by scientists at the UCLA School of Dentistry, the J. Craig Venter Institute (JCVI), and the University of Washington School of Dentistry, has provided insights into TM7’s resistance to scientific study and to its role in the progression of periodontitis and other diseases. The findings shed new light on the biological, ecological, and medical importance of TM7, and could lead to better understanding of other uncultivable bacteria. The team’s findings were published online on December 22, 2014 in PNAS. “I consider this the most exciting discovery in my 30-year career,” said Dr. Wenyuan Shi, a UCLA Professor of Oral Biology. “This study provides the roadmap for us to make every uncultivable bacterium cultivable.” Additional collaborators came from the University of Minnesota; the Skaggs School of Pharmacy & Pharmaceutical Sciences, University of California, San Diego; and Sirenas Marine Discovery, San Diego, California.